Subbed/Dubbed: Both, I watch the Dubbed version. Summary: After being bullied (supposedly) when she was younger, Mei Tachibana has become a social outcast by choice. Soon after she meets Yamato Kurosawa and after love at first roundhouse kick, they soon begin to fall for each other, resulting in Mei opening up to not only him, but other people as well. My Thoughts: Say I Love You was one of the most frustrating, yet adorable animes I've seen in a while. I've never been so involved in an anime in a while. While this show has an immense amount of problems, I overlooked them for the sake of the characters and the fact that I had grown attached to them for so long. Personally, I'd only watch this if it was a last resort and I really had NOTHING ELSE TO WATCH, but in my opinion, in that span of about 3 hours, it was fulfilled since I had nothing else to do. Like I said, it was adorable, it was frustrating, but watchable. One of the main problems I had was the fact there was no plot. There was nothing happening. No rising action, nothing. Sure, there was a problem that popped up out of no where, (I.E a model student starting to have an interest in Mr.Kurosawa ), but after 3 or 4 of the 13 episodes, they were resolved and then ZIP! A lot of people say bad things about the beginning of the show because she kicks him down a flight of stairs and they start to date. It's unbelievable, yes, but it's a friggin' anime, not an MTV show, it's supposed to be unbelievable as most anime are. It's just that nothing freaking happened! What kept me watching were the characters. The way they acted, the way they talked, it was very similar to my friends and how they are. Sure, we don't have these kinds of situations going on in our everyday lives, but this giant group of characters could've been plucked from my circle. They got mad over stupid things, they said some stupid things and acted very stupidly in very stupid situations and that, unfortunately, is the way my friends act and I get very frustrated with them for doing things like that, so of course I'd get frustrated at these fictional characters. I just can't yell at my friends, like I yelled at my computer screen, trying to get my advice through these people's heads. That's what kept me invested: the characters and how believable they were written. The art is interesting as it was visually pleasing, but not all complex and stuff. The drawings are simple, but there the simplicity is perfect for this kind of show. If it was overdrawn and complex, it would take away from the story, or whatever they want to call what happens in this 13 episode span. 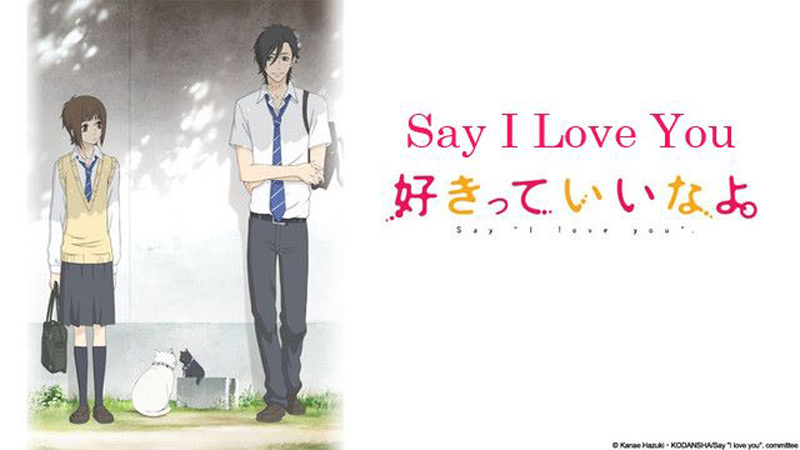 So, in all, Say I Love You wasn't anything great and was actually quite bad, but the characters and their shenanigans are what kept me watching. If you have nothing else to do, watching this won't kill you, but it won't make you happy either. You'll just feel like you wasted your day, but, hey, what else were you doing?